This is the UK edition unabridged audiobook of Listening Woman, published in 1992 by Isis Audio Books. The book is read by George Guidall onto 5 audiocassettes for a total listening time of 6.5 hours. The cassettes are in a white plastic case with a cover insert. The cover illustration is by Kevin Feeney. 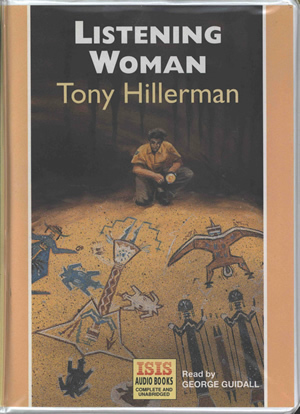 The book title is printed in purple horizontally on the spine, above Tony Hillerman's name printed in red. Below, the publisher's imprint and item number are printed vertically.